Nice everyday chairs. They are fairly sturdy for the average person. 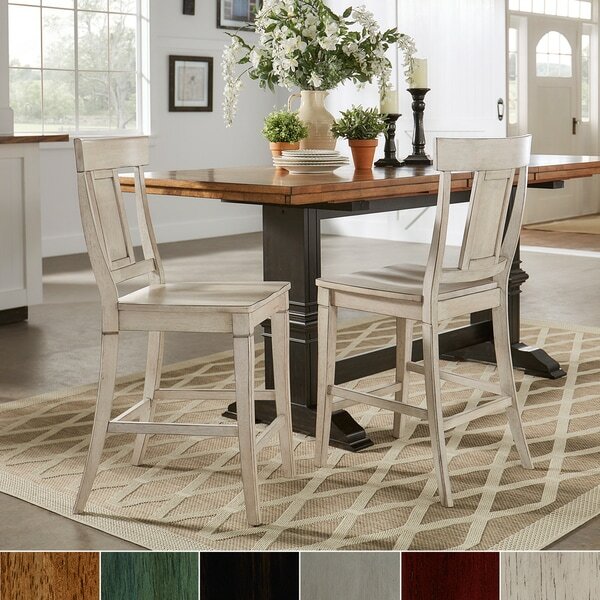 Add a beautiful, rustic look to your dining space with the Eleanor Panel Back Counter Chair from iNSPIRE Q® Classic. The chairs' visible wood grain and graceful panel back adds a sense of antique charm to this design. This chair set is perfect for casual kitchen dining, or placed around a counter height table. The chairs are available in several distressed finishes, including neutrals and bright hues, so you can mix or match colors and express your unique design taste. Perfect way to add a pop of color to our kitchen! Comfortable and sturdy. Easy to put together. The chairs are nice and the sage green we ordered, looks just like the picture. The instructions were not so helpful and we had to kinda work around it for a bit. Also were short 2 screws. But we do like them. These chairs are not exactly what I wanted on a few fronts. The antique white has more wood/ distressed areas than the picture showed, so the chairs don't look great in our white kitchen. The chairs are heavy and the seats are very large. The backs curve out, so they take up a lot of space. Finally, the screws to attach the seat do not have predrilled holes, making them very difficult to maneuver. That said, thet are a decent chair for the price. These would look better in a kitchen with natural wood cabinets. these are really nice looking chairs,however there are areas where they have not been sanded properly,and the stain is somewhat uneven. i ordered the oak,and its a lovely antiqued colour. they were delivered while i was out,and my husband unpacked,and very kindly assembled them,otherwise i would have requested a replacement for one of the chairs. The antique white does not look like the picture at all. It is a light gray, not an antique white. Also, as other reviewers mentioned, the chairs are much more distressed than the image suggests. Love these chairs. They're nice quality. These are great stools for the price. Pay close attention to the instructions when assembling. One of the four we ordered has a piece of wood that is obviously uneven on the back rest. I’m not sure how it got through the QC department. These chairs match my new kitchen perfectly and I have gotten so many compliments on them! They did take a bit to put together but I live them! Beautiful chairs and great value. Everyone complements them. Have not seen chairs this nice at furniture stores. These chairs are beautiful. My only complaint is that the “r” and “l” stickers came off of the legs and it was somewhat difficult to figure it out on the first try assembling. Not enough to lose a star. Would recommend. Good quality . Great quality and exceeded expectations. Love these chairs! Ordered the weathered gray, beautiful color. Very sturdy. Pretty simple to assemble. Took me a while only because I wanted to be super careful since people would be putting all their weight on them. Cannot wait for our first gathering! These chairs are very sturdy and pretty! My husband is a pacient guy and very handy but these tested him. They took a very long tome to assemble and were confusing because there were several extra screws that through him off. We would rather have extra hardware then not enough though! The chairs were relatively easy to put together and looked very similar to the photographs in terms of color. My only complaint is that after a few weeks, I am already starting to see chips in the wood veneer. "Is there a weight limit for the chairs?" "will the antique gray be backin stock?" This is expected to be back in stock in the antique grey option by March 3rd. "when will the antigue gray ladder back chairs be available"
"When will the antique black be available?" Please expect the black to be available in late September. "Where can I find the table that's in the picture?" The counter height table is not currently available. It is expected to be available in late September. "Is there a counter height table to go with these chairs?" We do not currently offer a matching counter height table. "What is the weight limit on these stools?" These stools can support a maximum of 250 pounds.